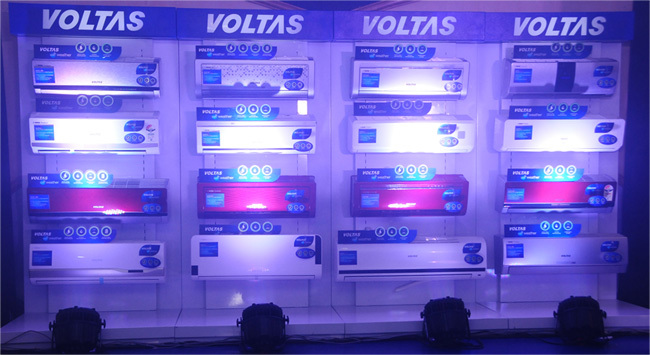 Voltas air conditioning and engineering solutions provider, announced the launch of its new and powerful range of all-weather split air-conditioners for the Chennai market, today. With the launch of new variants of air-conditioners, the Company aims to offer year round utility suited for different climatic regions prevalent in India. The Company has also pioneered the concept of energy-efficiency in air conditioners, and has continued to be India’s market leader in 2013 – 14. The introduction of the new line-up coincides with the auspicious occasion of Pongal in Chennai. Innovation is perennial to Voltas’ product offering and as part of that, the 2014 range of air conditioners include 68 New Models of Split ACs, including 5 Inverter models. Voltas aims to strengthen its lead in AC market by combining energy efficient products, with elegant looks and technological expertise, to the consumers. The unique ‘All Weather’ positioning, combined with Voltas’ range of differentiated products, and its ever expanding distribution footprint, has helped Voltas to achieve market share of 20.1% (FY’14), in Secondary Market, as per latest GFK Nielsen Retail Audit – Nov 13. The company has consistently outperformed competition in the highly competitive Indian Air Conditioner market, and has maintained its No. 1 position, throughout the year. Voltas is the proud recipient of the Ministry of Power's National Energy Conservation Award 2013 in the air conditioner category, in recognition of its promotion and sale of energy-efficient appliances. The award was presented by the President of India, Mr. Pranab Mukherjee. Alongwith the same, the company has received total of 14 prestigious awards in the last year including MEP Middle East 2013 award for 'Sustainable GCC Project of the Year’. Voltas is also one of the world's leading end-to-end solutions providers and project specialists in electro-mechanicals and refrigeration.